What should I buy if I need a basic CAD program (like AutoCAD LT)? In September, Carlson Software introduced a new program in their lineup: Carlson iCAD. This program is comparable to AutoCAD LT with basic drafting and inquiry tools but is built on IntelliCAD 8.3. Extra Bonus! IntelliCAD is much closer to AutoCAD than AutoCAD LT… you’ll have much more functionality at a cheaper price! And, if you ever need a little bit of GIS, you can do that too. With the 2018 version of the Autodesk products now released, anyone using an older version of AutoCAD (or IntelliCAD) can expect to start receiving 2018 .dwg files that they can’t access because it’s an incompatible version. This is where the DWG Convert function inside of DWG TrueView can be a lifesaver. 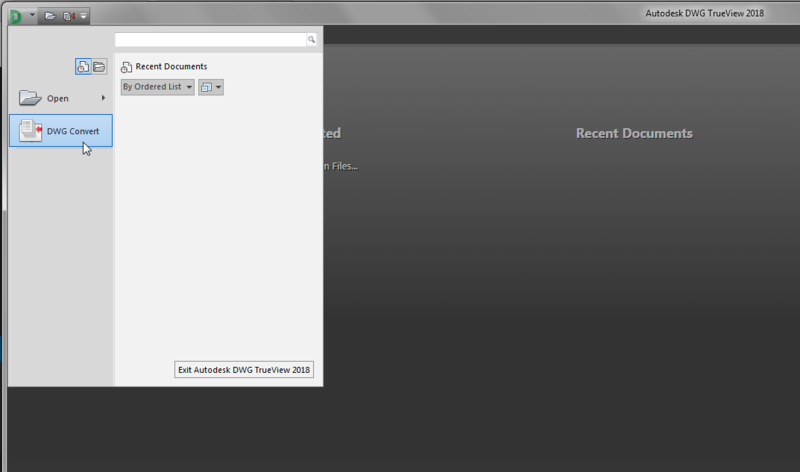 DWG TrueView is FREE utility available from Autodesk. They release a new version of this program every year, just like their other products. 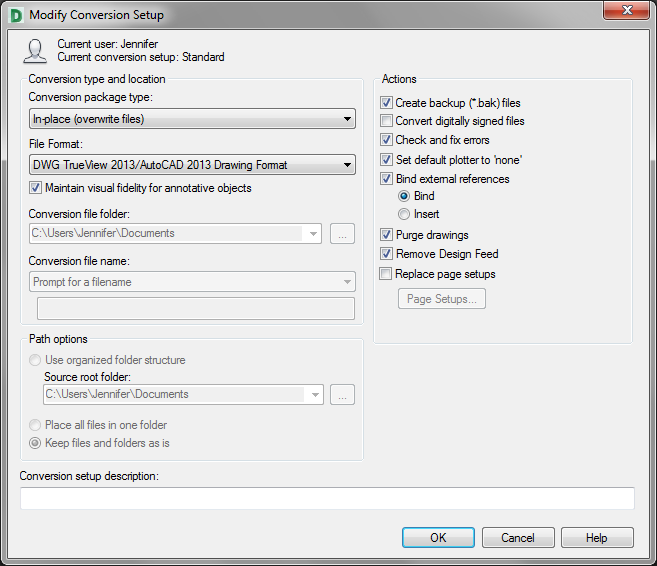 With the True Convert utility you can convert any newer version DWG or DXF to any earlier version. I’d recommend you enable the option that creates a .bak file with the original just in case you need it later. Inside the True Convert utility you can also enable several other options that will run routines such as Audit, Purge, XREF Binding, etc. during the convert process. You can download DWG True View 2018 here. Why do you prefer Carlson Civil Suite over Civil 3d? Well, how long do you have? Better grab a cup of coffee. Make it a Grande… isn’t that the biggest one? Anyhoo, no surprise, I think Carlson is the best option in software for land surveyors, engineers and contractors on the market these days. I always qualify my endorsement by acknowledging the fact that I make my living selling their software; but, I’m independent. And, if some day I get to the point where I no longer believe Carlson is the best option, I’ll be up front and admit that too. I’ve written several times and in various formats over the years about Carlson vs Civil 3d and those word-storms seem to hold up pretty well so, rather than repeat everything, I’ll just link to the old stuff and put a few new comments in at the bottom here. Post from 2009 Why Carlson Civil Suite And Not Civil 3D? If you want an outsiders take (from several years ago), you can read this article in CE News by David Palumbo of Dewberry describing the process his company undertook to evaluate the programs and find the right software solution for their surveying and engineering departments. And, yes, it’s pretty much cheating but I’m stealing most of the rest of this from my FAQ I miss my Land Desktop/LDD! What is my next, best option? Carlson has a lot of the dynamic functionality (RoadNet, LotNet, Design Pad Template, etc.) that we wanted in Land Desktop. But, the entities created by these cool automated tools are all standard CAD entities such as polylines and 3d polylines and text. Here is one of my favorite examples to illustrate the point. 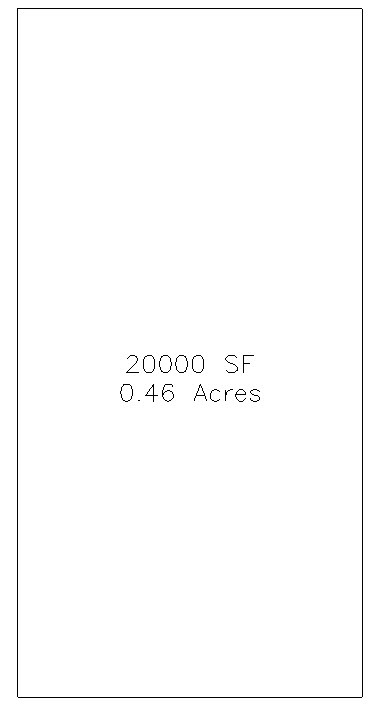 I have a 100 x 200 lot below that has a label inside for area in square footage and acres. The labels are generic and crappy-looking but I can change that later. 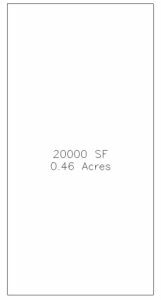 At this point, all I want to do is add a silly comma so that the area in SF reads “20,000 SF”. Carlson can be installed on top of any full-AutoCAD-based program such as AutoCAD, AutoCAD Map, Land Desktop or Civil 3d. Carlson cannot be installed on top of any version AutoCAD LT.
Whew, what’s with all these changes to Autodesk purchasing, renting, subscriptions, etc…? Can you help? As to the first question… Whew, what’s with all these changes to Autodesk purchasing, renting, subscriptions, etc…? My answer is: I have no earthly idea and God bless Carlson Software for loving their customers and making it so easy! In all seriousness, Autodesk’s pricing and purchasing model is changing so often and in substantial ways, I can’t keep up with it either. I am not an Autodesk reseller so I can’t help other than to make referrals and give my opinion. But, I have a couple Autodesk resellers that I trust and who have helped me keep my own licenses of AutoCAD and Civil 3d straight over the years. They have also been hugely helpful to my Carlson customers needing to purchase licenses of AutoCAD. Feel free to email me for a referral. Is embedded AutoCAD (OEM) more like AutoCAD or AutoCAD LT? The embedded AutoCAD (OEM) that ships with Carlson Survey (OEM) and Takeoff (OEM) is much closer to an AutoCAD LT than to full-AutoCAD. Follow this FAQ to see a list of the differences between AutoCAD, Carlson’s IntelliCAD and the embedded AutoCAD (OEM) platforms. What’s the difference between Carlson with IntelliCAD and with the embedded AutoCAD (OEM) platform? The price is the biggest difference. Whether you’re using Carlson Survey or Takeoff on the IntelliCAD or embedded AutoCAD (OEM) platform, the Survey and Takeoff functionality will be identical. Any differences are going to be strictly limited to the underlying engine – IntelliCAD or embedded AutoCAD. From a feature and functionality standpoint, IntelliCAD will be closer to a full AutoCAD and embedded AutoCAD (OEM) will be closer to an AutoCAD LT.
It’s a work in progress but you can check out this FAQ where I’m starting a list of the differences between the two programs. Is IntelliCAD more like AutoCAD or AutoCAD LT? I believe you will find the functionality of IntelliCAD to be MUCH closer to that found in full-versions of AutoCAD than to AutoCAD LT or even the embedded AutoCAD (OEM) programs that Carlson offers. 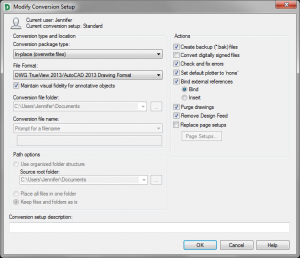 Now, you also shouldn’t expect IntelliCAD to be the equivalent of today’s AutoCAD. IntelliCAD is a generic version of AutoCAD and will have the feel of an older “model” of AutoCAD and be missing some of the bells and whistles included in newer releases of AutoCAD. But, it’s more customizable, supports LISP routines and 3D drafting. Follow these links to see my FAQs that explain the differences between AutoCAD, Carlson’s IntelliCAD and the embedded AutoCAD (OEM) platforms. You may also want to read this Software Review: AutoCAD and IntelliCAD that I wrote for Professional Surveyor Magazine several years ago. What’s the difference between Carlson’s annual maintenance and an Autodesk subscription? The main difference between Carlson’s maintenance plan and Autodesk’s subscription is that Carlson’s tech support is not tied to maintenance at all while Autodesk tech support is only available for no additional fee to those who are current on subscription. Also, in the past few years, there have been so many changes to Autodesk’s Subscription policies that it’s practically impossible to keep up and know exactly what you’re getting for that big price tag. Regardless of whether you’re current on maintenance, whether you’ve let it lapse, whether you’re using today’s version of the software or whether you’re using a version that’s 10 years old, tech support is free from Carlson. I can’t say that I use the embedded AutoCAD (OEM) version a lot because, to me, the platform underneath is much closer to an AutoCAD LT than it is to an AutoCAD and there are many functions I miss. And, since AutoCAD and IntelliCAD are so similar, it makes sense to also compare the features and functionality of the embedded AutoCAD products with IntelliCAD. Some AutoCAD commands, such as the Layer Tools that used to be in Express Tools and are now in the Layers II toolbar of AutoCAD, have been built into the Carlson menus. So even though you may not find the Layers II toolbar you can still freeze and isolate layers by picking entities on the screen. I’ll keep this post as a running thread and will add to it as I come across functions or features you may miss. In OEM – Can’t load LSP files (verified in 2016). This is possible in AutoCAD and IntelliCAD. In OEM – Can’t change command aliases (acad.pgp) or Carlson QuickKeys (verified in 2016) – although you may find a workaround in this Carlson KB Article:Bits and Pieces. This is possible in AutoCAD and IntelliCAD. In OEM – The command REGEN is available but REGENALL is not (verified in 2016). This is possible in AutoCAD and IntelliCAD. In OEM – Carlson Startup Settings (aka Launch Options) such as setting a default template (.dwt) file are not available in the OEM (verified in 2016). This is possible in AutoCAD and IntelliCAD. In OEM and IntelliCAD – Express Tools aren’t available. However, you can use Carlson’s Layer Tools and Layer Toolbar as a workaround to replace the Express Tools Layers commands and the Layers II toolbar. 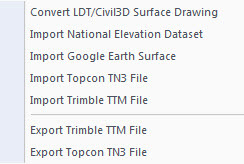 How can I access and use my old Civil 3d, Land Desktop, Eagle Point or Terra Model data? The simple answer is “use LandXML”. LandXML refers to a file format (.xml) containing data that has been generated from a civil engineering or land surveying software program. Simply put, the easiest way to convert, transfer, and archive data between Civil 3D, Carlson Software, Land Desktop, Eagle Point, TerraModel, and many other programs is to use the Import from LandXML and Export to LandXML functions available in these programs. Additionally, many machine control systems allow you to import LandXML files. I am most familiar with the Carlson and Autodesk families of civil/survey programs, so most examples in this article refer to them. For a little more current look at where LandXML is today, you don’t want to miss this archived webinar from September 2015: If You’re Not Using LandXML, You Should Be… Yes, All of You! The very best advice I can give to anyone who has years of archived Land Desktop, Terra Model or Eagle Point data and is still able to get into and run those programs is to start exporting all of it to LandXML files – starting yesterday! Many of these programs will be (or already are) impossible to re-install on new Windows computers so take advantage of it while you can. Since LandXML is the industry standard, having all that data in the generic XML format virtually guarantees that you will be able to convert and work with it in any new software package you use in the future. Civil 3d data is, by far, the most difficult data to share… In some cases it’s literally impossible to save data such as points and surfaces and be able to use it in any previous version of Civil 3d! However, you can use the EXPORTTOAUTOCAD commands in Civil 3d to basically explode all the custom entities so they can be opened and used in other programs or in earlier versions of Civil 3d. Of course, by exploding everything, you essentially lose any perceived benefit of working on the drawing in Civil 3d. Can I buy my AutoCAD from you? Nope. I only sell Carlson Software so you’ll need to find an Autodesk dealer to help you with Autodesk purchases. If you like, you can click here to search Autodesk’s site for a local reseller. If I buy Carlson, should I go with the embedded AutoCAD (OEM)? Or with IntelliCAD? or just buy AutoCAD? In my opinion, if you’ve been using any program that includes a full-license of AutoCAD as a platform (AutoCAD, Map, Land Desktop, Civil 3d) for years, you will be greatly disappointed and frustrated with the embedded AutoCAD (OEM) version. You may think you’re getting AutoCAD, but you’re getting something closer to AutoCAD LT.
So… long-time, mostly happy AutoCAD users should only consider running Carlson on IntelliCAD or installing on top of a separate license of AutoCAD. The next part is the hard part: IntelliCAD? Or AutoCAD? The answer to this will basically come down to $$$ dollar-signs $$$. If you already have a licensed version of AutoCAD, Map, Land Desktop or Civil 3d that can be installed under your Carlson then you are in great shape. You can hope for the best and install Carlson with IntelliCAD but you’re also prepared for the worst. If you’re not happy with IntelliCAD, you can install your same Carlson license on top of your AutoCAD. But, what if you don’t own a copy of AutoCAD or would need to pay to upgrade an old copy to run with Carlson? Is it worth it? It might be. If you’re a power-user and are truly losing productivity with IntelliCAD then I believe you can justify the cost to buy a new or upgrade an old AutoCAD. I usually recommend it this way, “If and when your frustration level reaches about 4000-bucks, buy AutoCAD!”. I know you’ll be shocked to learn that most sole-proprietors/business owners will stick with IntelliCAD much longer (or forever!) before they can justify the outlay of money for AutoCAD. For a more detailed look, see this Software Review: AutoCAD and IntelliCAD from Professional Surveyor magazine. FAQ Can I buy my AutoCAD from you?